Abstracts and field-trip guide for the symposium held February 16 through 19, 1994, Colorado Springs, Colorado. 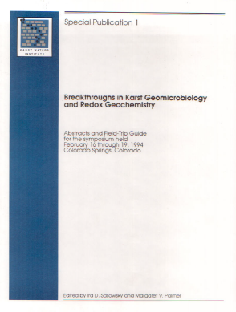 Recommended Citation: Ira D. Sasowsky and Margaret V. Palmer, Eds., 1994, Breakthroughs in Karst Geomicrobiology and Redox Geochemistry. Abstracts and Field Guide of the symposium held February 16 – 19, 1994, Colorado Springs, Colorado. Karst Waters Institute Special Publication 1, Karst Waters Institute, Charles Town, West Virginia, 111 p.